Custom notepads and sketch pads are very useful giveaways at trade-shows or events. They're useful products for any demographic and will remind customers of your company every time they write a to-do list or quick memo. For an add-on to corporate gift baskets or employee holiday gifts, go beyond cheap custom notepads and toss a customized personalized note pad in the package. Try some multi-colored options for younger audiences or recycled paper pads for eco-conscious employees - also a great way to start going green around the office! ePromos offers one of the largest selections of notepads, so you'll be able to find the perfect match for all of your needs. Whether you're taking notes during a meeting or making a shopping list before going to a store, the Castelli Tucson Custom Cube Notes are a helpful addition to almost any everyday task. Personalized notepads and scratch pads have incredible staying power in offices, schools and even at home. There is always a need for a place to jot down ideas, lists or notes. Why not give your clients and employees a custom notepad that showcases your company branding and message? 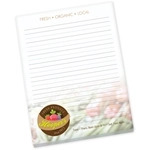 Look through ePromos selection of branded notepads today. Our selection of adhesive notepads come in a variety of sizes and colors. Whether you’re looking for a desk cube for easy reminder notes, or a larger pad for taking notes in a meeting, make your next promotional giveaway a personalized notepad. These products are sure to get tons of use and exposure, since they are a staple in so many offices and homes. Custom notepads are ideal for any company who uses stationary. They are useful to employees who have multiple tasks in a day and needs a place to write down reminders. They’re also great for any client who needs to make notes without marking up their original document. Trade show and conference attendees will find use for these - whether they’re jotting down contact information or taking notes from the keynote speaker. ePromos offers incredibly detailed printing for your logo and message. We also offer watermark printing to make sure your logo is in plain sight but doesn't get in the way of important information. With a range of customization options, you’ll be sure to find the personalization method to best match your logo and overall brand. Custom notepads are a practical gift that will promote your business every time someone has an important piece of information to remember or pass on. Shop personalized notepads and scratch pads today!